Northwest Designer Craftsmen at Washington State Convention Center: October 1 – January 4, 2019. 705 Pike St., Seattle, WA, 7am-10pm daily, Level 2 Main Galleria. Contemporary craft work by more than 75 artists in a wide variety of mediums. Katherine is pleased to have a willow bark tray in this exhibit. Rooted, Revived, Reinvented: Basketry in America: A traveling exhibition organized by the National Basketry Organization in partnership with the University of Missouri that visually chronicles the history of American basketry from its origins in Native American, European, and African traditions to its contemporary presence in the fine art and craft worlds. Katherine Lewis will have a basket represented in the “Living Traditions” part of the exhibit which showcases artists from the 20th and 21st centuries whose baskets perpetuate and transform the historical traditions in which they work. The exhibit is currently showing at the South Dakota Art Museum in Brookings, South Dakota until January 12, 2019. Art’s Alive La Conner: November 9-11, 2018, Maple Hall in La Conner, WA. Katherine has been invited to be one of the invitational artists in this year’s exhibit. 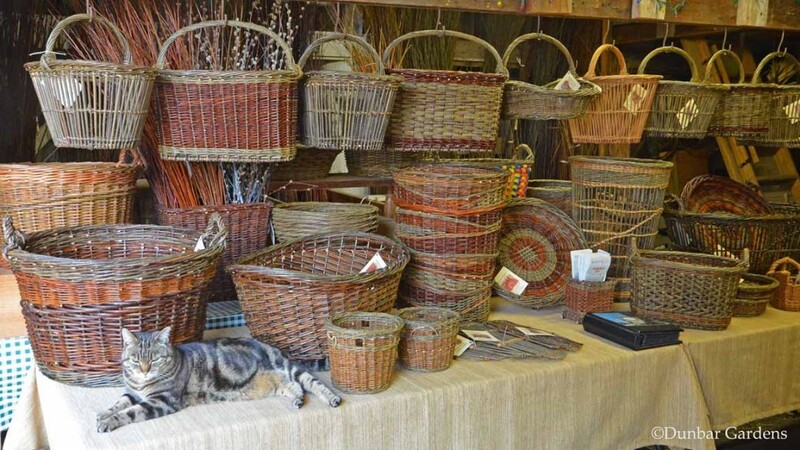 She has made a good number of new baskets for this event seen in the photo. 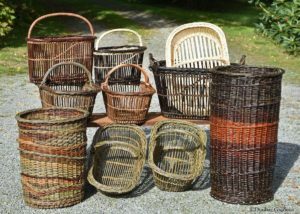 Many of them are fitched willow baskets. Katherine enjoys the challenge of this traditional technique, and she wanted to present mostly functional baskets for this show. 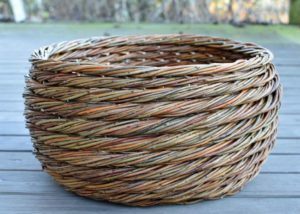 She will also be doing a willow basketry demo on Saturday, Nov. 10 from 12-2pm. 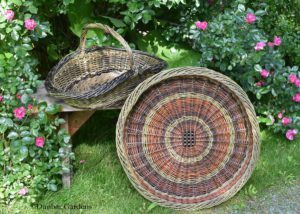 There is an exhibit of baskets by members of the Northwest Basket Weavers Guild that will be open at the Whatcom Museum concurrently with the Rooted, Revived, Reinvented: Basketry in America exhibit. View a selection of artwork juried by Lisa Telford and Katherine Lewis, artists featured in Rooted, Revived, Reinvented. Members of NWBW will be on hand on opening day to talk about basketry and the artwork on display. 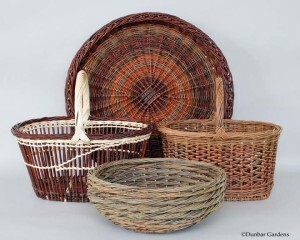 Katherine will have three willow baskets on display. This exhibit will also run February 3 – May 6, 2018. 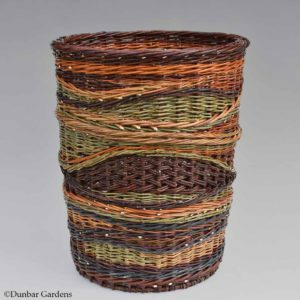 Northwest Designer Craftsmen (NWDC) presents a moderated panel of Northwest fine art basketry artists as another event at the Whatcom Museum. Panelists will respond to questions about their use of techniques, materials, and influences from moderator Layne Goldsmith, Fiber Arts Professor Emeritus, University of Washington. Panelists include Polly Adams Sutton, Jan Hopkins, Jill Nordfors Clark, Katherine Lewis, Lanny Bergner, Charissa Brock, Dorothy McGuinness, Nancy Loorem Adams, Danielle Bodine, Leon Russell, Judy Zugish, and Bill Roeder. Saturday, February 24, 2018, 2-3pm. Pacific Northwest Quilt & Fiber Arts Museum 20th Anniversary Festival: October 6-8, 2017 in La Conner, WA. The museum is celebrating 20 years of presenting exhibits and programs in the fiber arts. 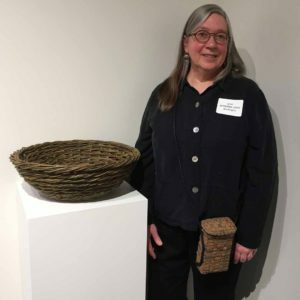 Katherine Lewis has donated the basket at the left to the auction for her appreciation of the opportunities that the museum gave her with a solo exhibit in August, 2015 and part of a group exhibit of basketry in July, 2017. Art Stop Gallery in Tacoma, WA. July 15-September 23, 2017. Group exhibit featuring work by members of the Northwest Designer Craftsmen. 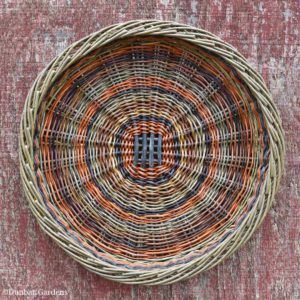 There will be craft work in a variety of mediums centered around the theme of baskets by 28 artists. 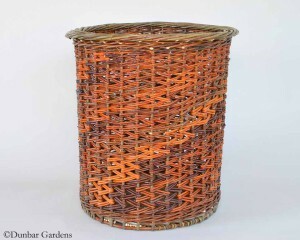 Katherine Lewis is showing her basket “Orange Zig Zag”. The show is inspired by the upcoming and concurrent National Basketry Organization Conference in Tacoma. American Art Company in Tacoma, WA. July 20-August 26, 2017. As an instructor at the upcoming National Basketry Organization conference in Tacoma, Katherine Lewis was invited to submit one of her baskets to the exhibit “All Things Considered 9”. 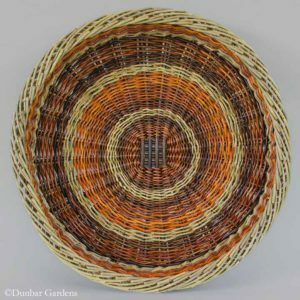 There will be a wide variety of juried contemporary basketry on display. Katherine is grateful to show her work “Home Grown” which shows off the beauty of the willows grown on her farm. More To Consider 2 at the National Basketry Organization Biennial Conference in Tacoma, WA. July 19-22, 2017. This exhibit is an open, non-juried invitational for work of NBO Members and conference attendees that will be displayed at the beautiful Kittredge Gallery on the campus of the University of Puget Sound during the conference. The NBO’s Guild Advisory Committee initiated this exhibit at the last conference to allow more members to share their work. 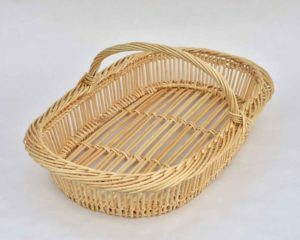 Katherine Lewis will be displaying her basket “Gathering” made from hand peeled willows. 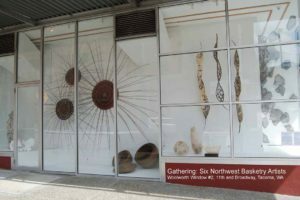 Gathering: Six Northwest Basketry Artists. April 5-July 27, 2017. Window exhibit at 11th & Broadway in Tacoma, WA organized through Spaceworks Tacoma “Artscapes” program. 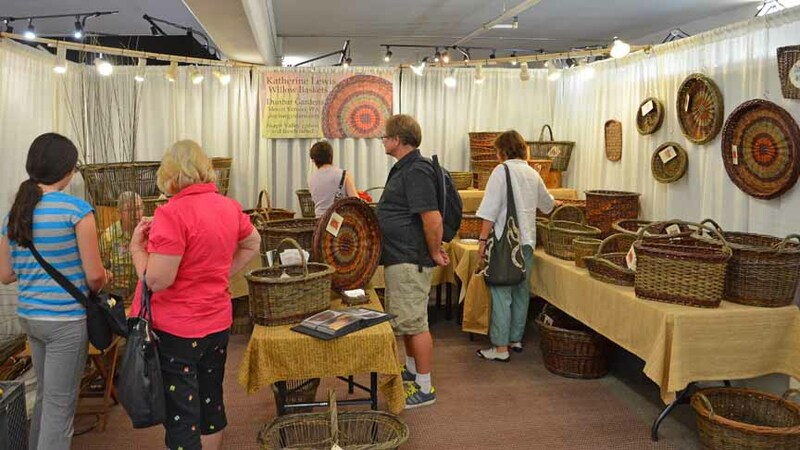 Gathering was made in conjunction with the upcoming National Basketry Organization conference. Katherine Lewis enjoyed working with Lanny Bergner, Danielle Bodine, Jill Nordfors Clark, Peeta Tinay and Dona Anderson on this project. Pacific Northwest Quilt & Fiber Arts Museum in La Conner, WA. “Woven Basketry” June 28-July 30, 2017. Katherine Lewis was recently invited back to this wonderful museum for a “creative basket making exhibit” along with Danielle Bodine and Nancy Loorem Adams. Katherine will have 8 to 10 baskets that represent a variety of forms and techniques. Both Danielle and Nancy are from Whidbey Island and are also members of the Northwest Designers Craftsmen. Art of the Garden at the Schack Art Center in Everett, WA. June 15-Sept 2, 2017. This biennial exhibit is a celebration of art created to enhance the garden and bring the garden into the home. Katherine made a garden gathering basket and an Irish potato basket from willows grown in our garden. What could be more appropriate? La Conner Quilt & Textile Museum: August 5 – 30, 2015 in La Conner, WA. Katherine Lewis has been invited to exhibit her baskets in the museum’s Landmarks Gallery for the month of August. There will be an opening reception on August 5 from 4-6 pm that will be free to the public. This is a great fiber arts venue and Katherine is excited for the opportunity for her first solo show. 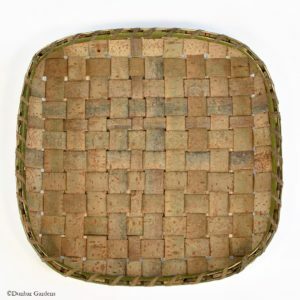 A Measure of the Earth: The Cole-Ware Collection of American Baskets: October 4, 2013-December 8, 2013, Smithsonian American Art Museum Renwick Gallery. Katherine Lewis has several baskets in this collection which was generously donated to the Smithsonian by collectors Steve Cole and Martha Ware. There is an exhibit catalogue authored by curator Nicholas R. Bell with photos of all the baskets and interviews with the makers. Read more about the exhibition on our blog. Unfortunately due to the federal government shutdown the exhibition opening was delayed. Katherine was unable to visit the exhibition opening while visiting Washington, DC in early October. Read about Katherine’s visit to Washington 2nd District Representative Rick Larsen’s office in the Skagit Valley Herald. A second visit was successful in November, and you can read about Katherine’s visit to the Cole-Ware Collection on our blog. Baskets are for sale at the farm year round at our simple farmstand. Phone or email ahead to guarantee we are available. Baskets can also be shipped and Katherine will consider work by commission. Check out the willow basket gallery for photos of Katherine’s baskets and prices. 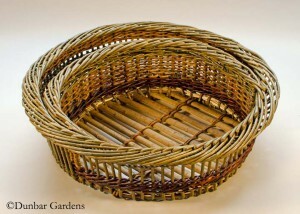 If you would like to see photos of willow baskets we have in stock, click here for the web page.